Berdorf bei Salzburg is a village in the north of Salzburg province′s Flachgau region with a population of approximately 1,600. The name′s claim to be "bei" ("near" or even "at") Salzburg is a bit dubious, as the village is some 30 kilometres away from the capital. Berndorf is not to be confused with the city of the same name in Lower Austria, which is significantly better-known for its many industries. The Salzburg Berndorf is mostly characterised by gentle hills, which are typical for the ice age landscape of the Flachgau, and by agriculture. The lake Grabensee is part of the municipality. Berndorf is therefore considered to be part of the Salzburger Seenland (Lake District). Beyond the lake, only the parish church is a noteworthy sight. Berndorf is not a typical commuter′s town like so many other villages in the area; nor does it attract any significant tourism. The parish is a very old one, its origins can be tracked back to 767 A.D. The current parish church was first mentioned in a document in 1130, but re-built in combination with a chapel (Annakapelle, both buildings in Gothic style) in 1440. In 1684, the tower gained its current Baroque appearance and the interiors were altered. 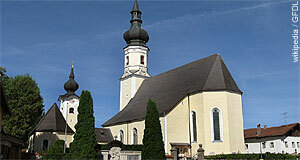 At this time, the Strahlenmadonna of Berndorf, a depiction of the Madonna, made the village a popular centre of pilgrimages. Today, Berndorf would justify a quick stop if you happen to tour the northern Flachgau and neighbouring Upper Austria; maybe to go swimming at the Grabensee.